Results for the 2019/2020 GHS Entrance Examination is now out! Kindly find below the list of successful candidates. Upon successful confirmation of your child, parents are advised to contact the admissions department of the school immediately or call 0808 428 3124, 0803 065 3294 for further details. Establishing a high standard of education is not an easy feat; maintaining it for five decades is even more challenging. After half a century of exceptional performance, we are even more committed to the education of unique individuals with global perspective and zeal for excellence. To date, more than 14,000 children have attended Grace Schools. 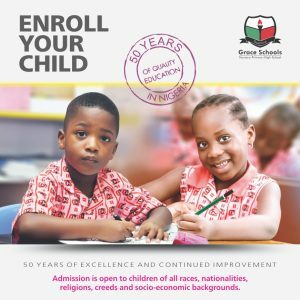 As we admit children for the 2018/2019 Academic Session, we stand on our longstanding principle of instilling value-character education and bench-marking the best of technology to deliver world class education. Generations of alumni bear witness to our achievements. They are proud to approve us for their children. And recommend us to the children of friends, just like you. Children School Tel: 0902 075 1420, 0802 333 2085, 0803 315 8471. High School Tel: 0808 428 3124, 0803 065 3294. Admin Tel/WhatsApp: 0802 306 1195, 0703 327 0132.